You would be amazed at just how much of an impact that the surrounding environment can have on children while they are learning and exploring through play with others. If you think about it, the more stale and uncomfortable the environment is, children will only have a certain level of creativity and expression. Studies have actually shown that children have a higher level of interaction and creativity when they are placed in a comfortable and stimulating environment. If you are looking for ways to both brighten up as well as soften up the area that your children play in, you may want to think of the helpful addition of a play mat. With the right play mat, you are sure to see that your child will want to get right down on floor level with their siblings of playmates and fall into a world of play and self-expression. One play mat that many parents and even day care providers stand by happens to be the 1-2-3-4 Kids Play Activity Mat. This is a whopping five square feet of fun colors, numbers and shapes that will not only provide a soft floor for kids to play on, but also a marvelous way to stimulate their minds. Soft and hygienic, this play mat is fabulous for giving kids a nice way to play on floor level without becoming uncomfortable after only playing for a little while. Great for any kinds of floor activities, this play mat is a must for the savvy parent as well as the thoughtful day care provider. When you have children, it is always nice to see to it that they have a safe and clean room that they can play in. If it happens to be their bedroom that is the main area that they are going to be playing in, you can work right along with them when it comes to cleaning. You would be amazed at the kind of results that you can get when you start by teaching your children all of the good things about cleaning at a very young age. Young children can learn from you when it comes to finding the best ways to keep their room neat and organized. After all, with the proper places for storage and a good base of cleaning skills, they should be able to keep their room looking wonderful even after they have been playing for a while. As a parent, you simply need to teach them how to sort all of their toys and show them the best ways to keep everything in order and picked up. If you find that you are running into a lack of space when it comes to some of their books and even some smaller toys, you may actually want to look into the addition of a good bookcase. A bookcase is the perfect piece of furniture to help house a bevy of books along with any other knick knacks that are in need of a home. A fun and colorful option is the Circus Book Shelf, which would definitely be a magical addition to any child's room. With plenty of whimsy and a whole lot of cubbies for storage, this is a bookshelf that both parents and kids alike would be proud to have in their home. Experts say that reading to your child, beginning at a very young age, will often instill the love of reading in them. This will serve as a foundation for future learning. As a parent or caregiver, you want to open your child's mind and imagination. Reading, even to an infant, is a great way to accomplish that goal. And some people subscribe to the theory that a child can hear you while still in the womb and will read to their unborn child. As they grow older you will likely hear that familiar plea of "read me a story" every night at bedtime. They will often ask that you read the same book over and over, never tiring of the same story. And eventually they will get to the point where they are reciting the story to you. They may tell you that they are reading it to you, even though you know its not technically reading, don't let on that you know their "secret". This memorizing of a story does actually pave the way for reading as they learn to recognize certain words and spellings. 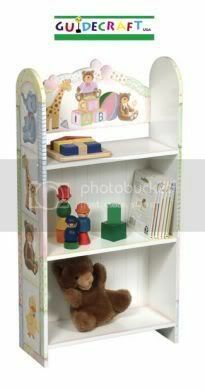 While you are considering your options for decorating your child's room be sure to include a bookcase or bookshelf. There are some great designs available, perhaps a firehouse bookcase for a boy or a doll house designed bookcase for your sugar and spice girl. You can start out by filling it with books you loved as a child; chances are they will love them too. One of the most amazing things about kids is their imaginations. Remember when you were a kid playing in the backyard with your best friend? You might be on a swing set, but to you it represented the vines in a forest and you might have been Tarzan. Or perhaps you were at the playground riding one of those spring action animals. Of course, in your mind you were Zorro or The Lone Ranger and when you were around no bad guys dared to show up. Times have changed some and while there are more sophisticated and newer toys, nothing beats a child's imagination. As a parent or caregiver, you know that kids need guidance of course, but they also need room to grow and explore. The best part of these changes in your child is that you get to see them happening and you wouldn't change that for anything. When considering toys for your child you want to keep in mind that while you naturally want something that is entertaining, children also need toys and activities that stimulates their minds and uses their imagination. Toys or games that are used in pretend play are very important in that aspect, as it gives them something tangible to use, yet they also get to figure out how to use it in their own way. 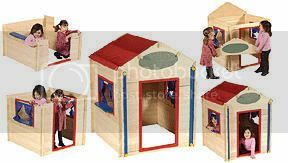 A great example of this type of pretend play is the Build it Myself Playhouse. This wonderful toy is made of solid wood, with boards that slide together like a puzzle. This enables them to change it around so it becomes a fort, Puppet Theater or whatever strikes their imagination. Which, of course, is the whole point, using their imagination. Bring one of these home and be amazed at what your child is capable of creating. Music soothes the savage beast, and works wonders on kids too! It has been proven that children who are introduced to music at an early age benefit in many different ways. It is also said that they tend to perform better academically. All a child really cares about is how much fun it is. So, in the spirit of beautiful music and children everywhere, consider getting a toy piano for your little musician. Schoenhut toy pianos are designed for children and built to endure active play. Juliard graduate Margaret Leng Tan claims that anything you can play on a big piano you can play even better on a toy piano. These pianos are unsurpassed in quality, pitch and durability with each one crafted by hand and individually tuned. Their overtones, charm and unique sound have gone from novelty to fine musical instruments. There are many styles to choose, from the My First Piano to the more traditional Spinet as well as The Classic Baby Grand Piano and the Fancy Baby Grand piano. Young and old alike will be enthralled with these pianos and their wonderful sounds. Children will be thrilled that they are able to produce the sounds that come from these pianos. Considering a musical instrument for your child can be tough. You are not always sure of what type or style to get. It can be a daunting task. Keep in mind that starting your youngster off on a toy piano can encourage individual expressionism as well as perhaps producing the next Mozart. Educating children is a priority among parents and caregivers. While children prefer fun over what they consider "boring stuff". This can sometimes result in a battle of wills, where the adults may win but the kids are anything but receptive to the idea. Thankfully, there are some wonderful compromises. The Circle of Fun is just one of those compromises. Puzzle benches connect together to form this circle of fun. There is something to be said for a toy that encourages learning and pulls together for a "never ending" trail of fun. The circular design helps keep their interest and engage each other as they play with each section in turn. It can also be separated into four sections allowing for individualized play with multiple kids. There are seven classic toys or games including an Abacus, Pathfinder, Fun Fruits to Match, Magnetic Circle Express, Gear Panel and Sculpture Mazes #'s 1 and 2. It is amazing to watch how well children tend to get along with a toy such as the Circle of Fun. they can take turns on each section and take turns with the seven different activities. If the need arises, or if you just want to change it up a bit, it can be separated for further fun. 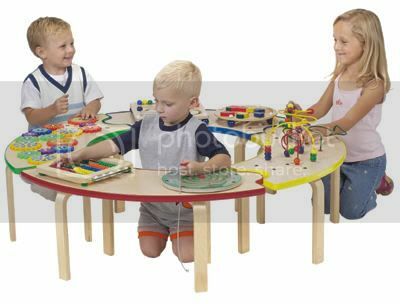 It is an amazing activity center toy that guarantees hours of fun for children. It is a perfect toy for a doctor's waiting room, schools, day care centers or even your home. Round up the kids, set up the Circle of Fun and let the games begin! You may have never thought that a rug can be a wonderful educational tool, however with a great piece from Flagship you are guaranteed to get a rug that is both fun and functional. When it comes to a great place for children to relax and spend time with others, there is really nothing better than a colorful, cozy carpet that they can gather on. The Alphabet Tree Kids Educational Round Rug by Flagship Kids Carpets is an exceptional piece that you would be proud to have laying out in your home, day care or even office setting. No matter where you place it, this rug is just right for kids of all ages to hang out and socialize. To make this round rug even better, there are even several ways that kids can even use it in order to learn. On this particular rug, kids have the chance to look at the alphabet, which can be found in the apple tree. There are even numbers on the pretty daisies, which happen to be just right for teaching little ones all about counting. These kids rugs have two different sizes that you can choose from, and they also have all of the safety standards that you would expect from any product for children. All children who have the chance to sit and play on one of these rugs are sure to fall in love with them. With such a fun environment complete with such a great accessory, you are bound to see your children growing and learning right in front of your very eyes. There are times it can be difficult to keep one child entertained and stimulated. As such, the mere thought of being responsible for a group of them, not just playing, but getting along while they play can be pretty intimidating. There are a few things that just might help. Most kids love to dress up and pretend to be something they are not. One of the favorites among kids is the Children's Playhouse/Theater. They can spend hours planning the perfect play or performance. And usually they get along fairly well while doing this. It can be fascinating to watch the process, it is a very serious undertaking to the kids and their desire to have it "just right" can even be comical at times. However, try not to laugh (it may not be a comedy they are working on!) until you know what you are supposed to do. Be warned, if you spend too much time around them during the planning process they will very likely give you a job to do, and it probably wont be a very glamorous job at that. Depending on the group of kids, time to spend and tempers being kept under control, it could be a several day affair to get the play off the ground. That's ok too, because that will give you plenty of time to get your video camera out and record it for posterity. Or at the very least, it will make interesting viewing when they bring home their first serious date!